A failed attempt to reform the method of selecting the Chief Executive raises the likelihood of future protests. As a result, the next Chief Executive will be chosen in spring 2017 by the same method as in 2012, namely an election committee of 1,200, something which is likely to provoke protests as 2017 approaches. Plans to introduce further reforms to the legislature itself, where currently only half the seats are elected in Hong Kong-wide geographical constituencies, will also be put on hold. Given the lack of any meaningful dialogue over the reform package during and after the “Occupy” protests of last autumn, the result was not a surprise. Hong Kong society has been divided over these issues, and the outcome of the vote will do little to bring an end to polarized politics. The last year has seen emotion and identity politics come to the fore, rather than pragmatic or rational debate. The events of the last year have also damaged Hong Kong’s relationship with Beijing and with the rest of China more widely, and demonstrated gaps in perception. The central government’s White Paper on Hong Kong, issued in June 2014, was intended to reiterate a commitment to the “one country two systems” principle under which Hong Kong retains a high degree of autonomy and a separate system within China. However, many in Hong Kong feared that it marked the beginning of an effort by Beijing to tighten its grip on the city’s politics. The restrictions to the nominating process set out in the August framework reinforced these views, though it should have been clear that the central authorities had long intended to prevent candidates it found unacceptable from standing. Indeed, over the last year the idea that Beijing’s control over Hong Kong affairs has increased gained wide currency in Hong Kong and overseas. But as the debate, and now the vote, over the constitutional reform package showed, while it can effectively limit the scope of reforms to the political system, Beijing’s ability to influence Hong Kong politics and society has certainly not grown over the last year. Looking back over the failed attempts to introduce national security legislation in Hong Kong in 2003, or national education in 2012, this seems to be part of a longer-term pattern. How might Beijing respond? 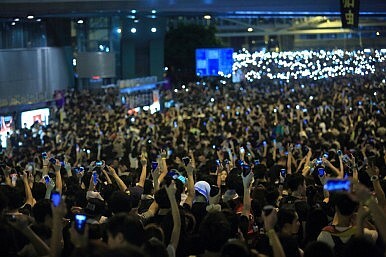 By far the most likely response is to sit tight, and for Beijing to reiterate the central government’s commitment to “one country two systems,” “Hong Kong people running (or administering) Hong Kong,” and Hong Kong’s “high degree of autonomy.” There are few alternatives for those in Beijing: Greater indirect influence is possible, but would be limited in potential scope and risky in a transparent society like Hong Kong; and actually curtailing elements of “one country two systems” would be difficult in practice, require formal constitutional changes, and undermine China’s public commitments to Hong Kong, including Beijing’s consistently stated approach since the handover. But for Hong Kongers, the more important question is the local response. To be sure, the rejection of the government’s package is a set back for Beijing, but its biggest impact will be on Hong Kong. In the absence of any meaningful consensus across Hong Kong on the way forward, it is hard to see how the government can return to the issue of constitutional reform. Meanwhile, the sense of a broken political system in transition will continue to hang over Hong Kong politics for some years to come, though the next legislative council elections, due in 2016, may give some indication of popular views on the way forward. Further, the executive’s limited legitimacy and structurally problematic relationship with the legislature are hampering effective governance, though given the resilience of society and the open and flexible nature of the city’s economy, there are plenty of reasons why Hong Kong should remain prosperous in spite of this. Indeed, Hong Kong’s separate system remains in place, in politics as well as economics. Its liberal and open society, free flows of information, goods and capital, robust legal and judicial apparatus, and free market economy should create confidence in the city’s future, in spite of the political challenges. At the same time, competition from neighboring cities in China and across Asia is growing. Hong Kong needs leadership and vision from the government and legislators and across society. Given the broken politics of the last year, this will be challenging, but it is the only way forward for Hong Kong. Dr. Tim Summers is a Senior Consulting Fellow at the Asia Programme, Chatham House. Supporters of the Beijing-backed package claim to have public backing on their side. The truth is more complicated.